At the beginning of WWII, the Belgian Air Force was in the process of modernization. Like many smaller countries, Belgium did not have the resources to do a complete overhaul of their forces so was integrating new types in service as monies allowed. The fighter force consisted of three types, two of which were biplanes. From Italy, the Fiat CR.42 Falco. From the UK, the Gloster Gladiator and the Hawker Hurricane. The Hurricane was the most modern type in service and was identical to the British Hurricane I, though with some Belgian instrumentation. Even with these three types, the numbers in service were quite small. Belgium had always maintained a neutral status regarding foreign alliances. As a result, its need for fighters was one that required the ability to quickly intercept hostile aircraft intruding on its borders. To make matters worse, other countries were not willing to sell Belgium their top of the line aircraft, so Belgium had to make do with less than the best. When war finally broke out and Belgium was invaded, the forces put up a spirited defense, but were rather quickly overrun by superior numbers. ABT was a French decal maker that offered a number of interesting subjects, most of which were of European origin. This was in the beginning of aftermarket decals so there wasn't the standard format that one sees in the various sheets produced today. Along with the 3x3 inch decal sheet was a small instruction sheet. 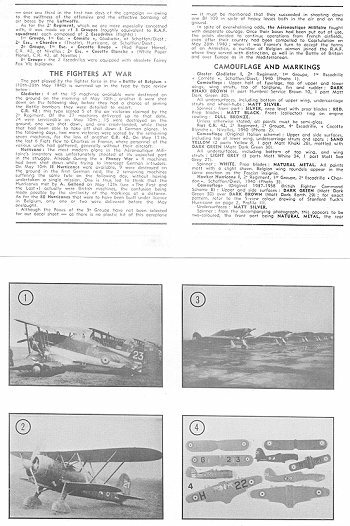 This sheet gave a short history of the Belgian AF at the time as well as a brief history of the three aircraft during the war. There is a good description of what parts of the aircraft are painted what colors, though all colors are given generic names. The use of FS 595 colors was not in widespread use at the time. In lieu of drawings of the aircraft, there is a center section consisting of a photo of each aircraft as well as a photo showing the decals on the actual kit parts. A rather novel approach that I have not seen anywhere else. The decals themselves are a bit yellowed from age, but should still be usable. I used a set of ABT decals about 15 years ago and found them to be quite good if a bit thick. They were impervious to Microscale setting solutions but should function well with the stronger solvents now on the market. 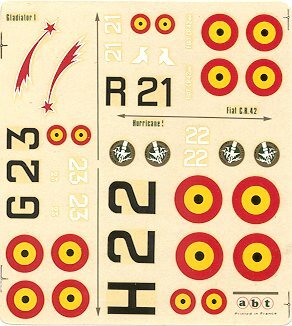 The decals offer a compete set of markings for the aircraft chosen. I would think they they were designed for the old Airfix Gladiator and Hurricane as well as the Revell CR.42. If using the sheet today, you have much better kits available. Hasegawa for the Hurricane, Misterkit for the CR.42, and Heller for the Gladiator.